Cosmetic dental veneers involve the placement of a wafer-thin shell of porcelain on the front surface of your tooth. They are solely used for cosmetic purposes, so only the front, visible teeth of your smile are treated. To ensure the veneer bonds securely to your tooth, it is necessary to shave a small portion of the outer tooth layer before placing the veneer. Dental veneers typically require just two short office visits. Each veneer is custom crafted to achieve your goals and provide a natural and seamless blend within your smile. Veneers are also stain-resistant and durable enough to withstand everyday dental function. 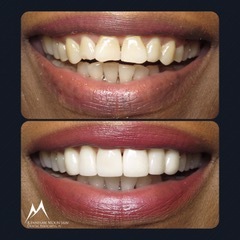 For most patients, getting cosmetic dental veneers is a life-changing decision, as a white, balanced and attractive smile can affect how patients feel about themselves as well as how others perceive them. What would you change about your smile? If you have stubborn stains that teeth whitening won’t reverse or wide gaps between your teeth that bonding is unable to fix, consider a smile makeover with porcelain veneers. At Kennesaw Mountain Dental Associates, we make it easy to improve your smile. Contact us today to schedule your consultation.